Anthony Pellicano has been a member of the Divine Wisdom Catholic Academy family since February 2012. This is his seventh year as the Douglaston Learning Lab Coordinator, and he looks forward to another opportunity of working with so many talented students in all the grades. Anthony graduated from Pennsylvania State University with a B.A. in Film. He went on to run a successful post-production company, but teaching continued to appeal to him throughout the years. He finally closed his company, graduated from Long Island University with a 4.0 G.P.A. and a dual Masters Degree in Childhood and Special Education. 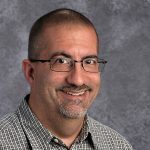 Anthony has worked in the Brentwood and South Huntington School Districts as a Special Education Teacher, before joining us here at Divine Wisdom Catholic Academy. A foundational concept for his teaching style is to maintain self-awareness, and to always be willing and open to change. Teaching should not only be from teacher to student, but student to teacher as well. Anthony continues to learn from his students, as he hopes they learn from him.